NOTE:with the new development of XCrySDen this document has became a bit obsolete. Several new menu items were added and a few were rearanged since this document was written, nevertheless it should still be useful. Below is a link to an interactive snapshot of XCrySDen main window with its menus as they appeared in an old version 0.3. The appearence of the main window and menus in the current version differs a bit, nevertheless the snapshot is still useful. However, the description of the menus that can be found here below refers to the new version. Changes the background color of render window. Custom background color can be specified as well (via Custom ... entry). 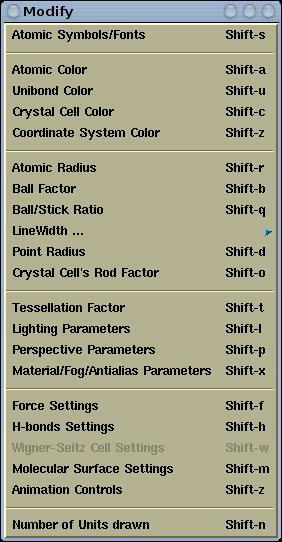 Creates new CRYSTAL-95/98/03 input file (just standard geometry input and geometry manipulation keyword sections (refer to CRYSTAL-95/98/03 User manual). User will be able to construct new structure from scratch. Within this cascade menu, the PWscf's pw.x Input and Output files can be opened. 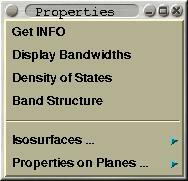 Within this cascade menu, the CRYSTAL-95/98/03 input and properties files can be opened. by the ...Open CRYSTAL-95/98/03 Input menu, the user is able to manipulate standard geometry input and geometry manipulation keyword sections (refer to CRYSTAL-95/98/03 User manual) and render the crystal (molecular) structure. Open WIEN2k Struct File : displays crystal structure from the struct file. Render pre-Calculated Density : reads struct, output5 and rho files and renders crystal structure and precomputed charge density. Calculate & Render Density : A 2D or 3D region for charge density calculation can be interactively selected by mouse-clicking. XCrySDen generates in5 file(s), calculates and renders charge density either as isolines/colorplanes (2D) or isosurfaces (3D). Select k-path : Reads struct file and renders first Brillouin zone with special k-points. K-path can be selected interactively by mouse-clicking these points. 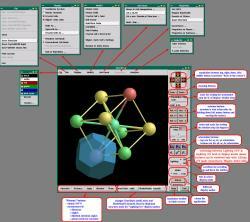 Fermi Surface : trough a series of tasks user is able to render the Fermi surface. Closes the current case. Technically the current XCrySDen process is terminated and a new one is started. Saves currently displayed structure in XSF format. 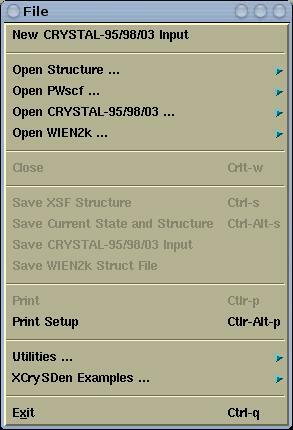 Saves currently displayed structure as WIEN2k struct file. Prints the currently displayed in EPS format. Please take a look at this hint for creating good quality print-out. Periodic Table of Elements can be found here. In this cascade menu one can found example files included in the XCRYSDEN distribution for all supported file formats. Toggles the display of XYZ Cartesian coordinate system, which is rendered at the lower left corner of the render window. Toggles the display of atomic symbols. Toggles the display of crystal cells (only for periodic structures: polymers, slabs, crystals). Toggles the display between the bonds that have the same color as atoms and so-called unicolor bonds where all the bonds have the same color. Toggles the display of H-bonds. See also the Modify-->H-bonds settings menu. Toggles the display of forces, which are rendered as vectors. The settings of the force display can be done via Modify-->Force Settings menu. Toggles the display of Wigner-Seitz cells. 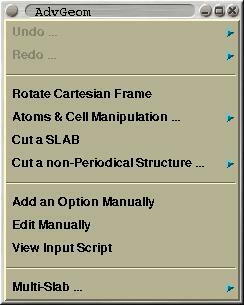 The settings of the Wigner-Seitz cell display can be done via Modify-->Wigner-Seitz Cells Settings menu. Toggles the display of Molecular surface. The settings of the Molecular surface display can be done via Modify-->Molecular Surface Settings menu. Toggles between perspective and orthographic projections. Makes more distance object appear "darker" (or more foggy). This effect produces more realistic appearance of the scene. The depth-cuing can be customized via the Material/Fog/Antialias Parameters menu. The images displayed on the screen are aliased due to final resolution of the screen (typically this is 75dpy). One can improve this aliasing by a technique called anti-aliasing. It enhances the graphics quality. Anti-aliasing is computationally very demanding, hence it typical use is for printing, where it is very useful, because it makes much superior print-out. The anti-aliasing can be customized via the Material/Fog/Antialias Parameters menu. ball_size = ball_factor * spacefill_factor * atomic_radius. spacefill_size = spacefill_factor * atomic_radius. In Lighting-On mode crystal cells can be rendered as lines or as rods (sticks) with shades (similar to bonds). Switches between lines and rods display-mode. This option has no effect in Lighting Off mode. Toggles between the display of primitive or conventional cell-mode. Switches between two possible display-modes of the unit cell. What is meant by this? Pops-up toplevel window, where color for unicolor bonds can be set. Pops-up toplevel window, where color for crystal cells can be set. ball_seize =ball_factor * spacefill_factor * atomic_radius. -->WireFrame's LineWidth Sets the line width for WireFrame Lighting-Off display mode. -->PointLines's LineWidth Sets the line width for PointLines Lighting-Off display mode. -->Crystal Cell's LineWidth Sets the line width for crystal cells (for line display-mode of crystall cells). -->Lighting-Off outline width Sets the outline width for all but wireframe lighting-off display modes. Sets the points size for PointLines Lighting-Off display mode. rod_thickness = rod_factor * hydrogen_covalent_radius. Here the OpenGL lights can be customized. One can enable up to 6 light sources, position them and set their properties. To set the lighting parameters is not very easy and intuitive. At least basic knowledge of OpenGL lighting is required. Here perspective parameters can be modified. There are three factors: fovy, front, and back. The smaller the fovy the larger the perception of the perspective. With the front and back factors the front and back clipping planes are set. The smaller the back parameter the more the structure (=displayed objects) is clipped from the back side. The front parameter is counter-intuitive, meaning the smaller it is the more the structure is clipped from the front side. Here the OpenGL material properties of atoms and bonds can be customized (Materials). Also the depth-cuing (i.e. fog) and anti-aliasing parameters can be edited. Sets the number of displayed unit cells in each A/B/C direction. This menu is mented solely for CRYSTAL GUI. Here one can manipulate an existing structure by various procedures. Among supported options are: (i) cutting a slab out of a crystal, (ii) generating a supercell, (iii) adding, removing and substituting atoms, ... Here you can found description of this menu and the usage instructions. A few useful tools can be found here. This includes: Color Scheme, Data Grid, k-path Selection and Periodic Table of Elements. Pops-up toplevel window, where different color schemes can be selected. Useful when examining the structure (nearest-neighbor analysis, slab analysis). A toplevel window with Periodic Table of Elements pops-up.